Sorry about that title. I am having a bit of fun with the search engines. 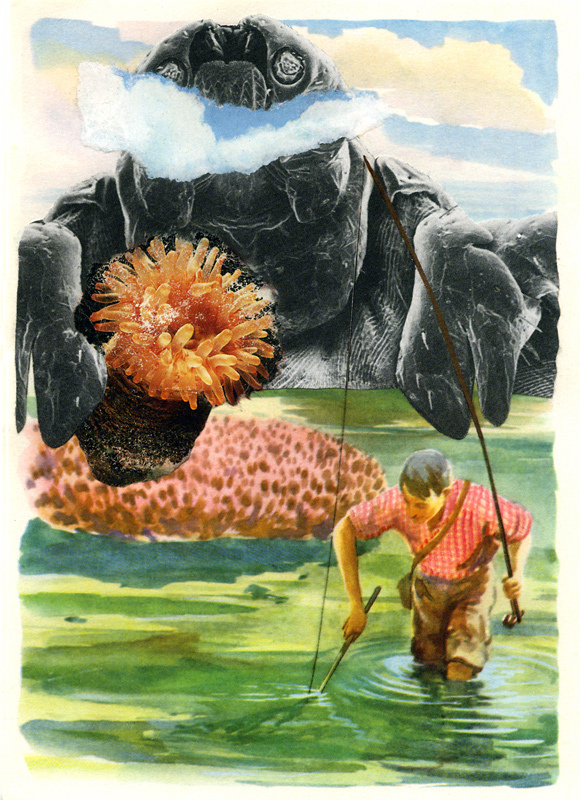 On a serious note, today’s entry is about how collage can be put to the service of more than irony, shock, whimsy, irreverence, or cynicism. Let me say first, if you please, that all those things can be valid, even pleasurable, effects. They are rooted deeply in the history of the medium. One could make the case that a collage artwork is never more than a step or two removed from the essence of dada, surrealism, or popism. On the other hand, for me, there are times when that creative genealogy is best put aside, in favor of a different tone. Developing works with special meaning to those for which they were intended has always been some of the most fulfilling time I have spent as an artist. 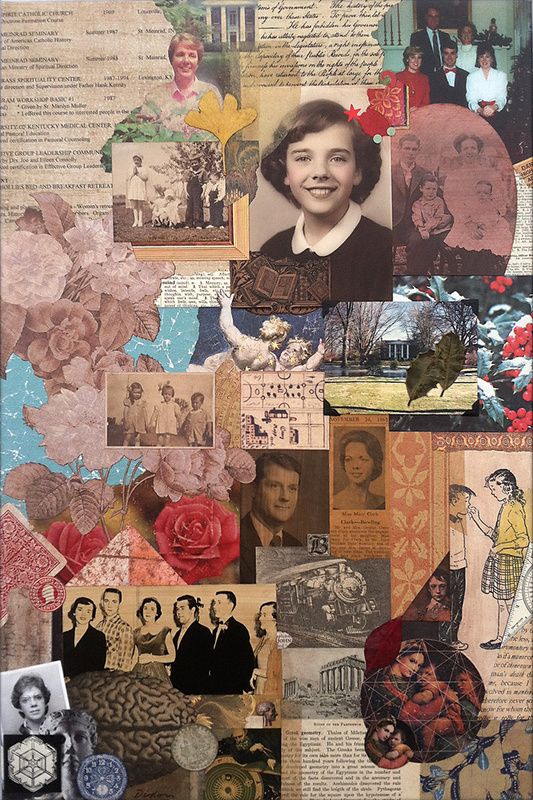 Collage has the potential to capture profound significance for a recipient, especially when it is personalized with meaningful artifacts and memorabilia. 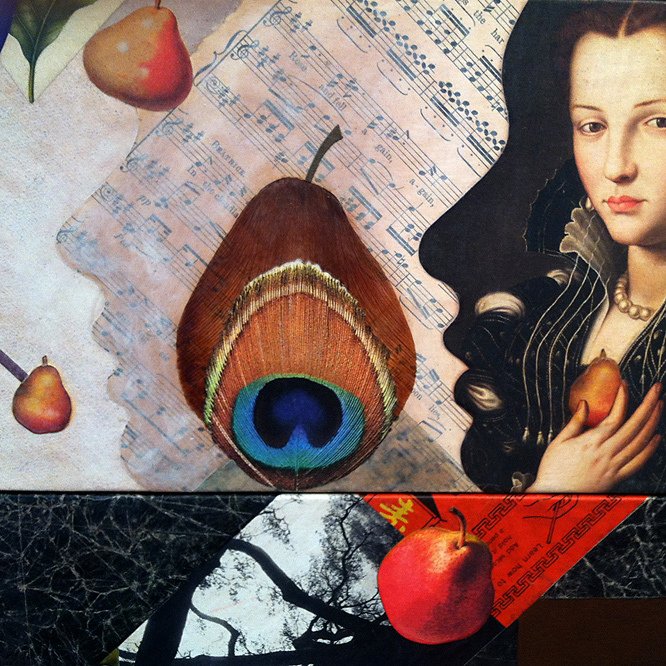 Also, there is an opportunity for the artist to thoughtfully select and integrate additional ingredient elements for greater depth and layered associations. The project featured below began with a discussion about how all of us accumulate “stuff” that will never rise to the level of a family heirloom, but cannot be comfortably discarded because it has true meaning in the context of one’s journey in life. The patron took to heart my offer to embed many of these things in an artistic expression that would likely become a treasure for descendants instead of a burden of disposition. 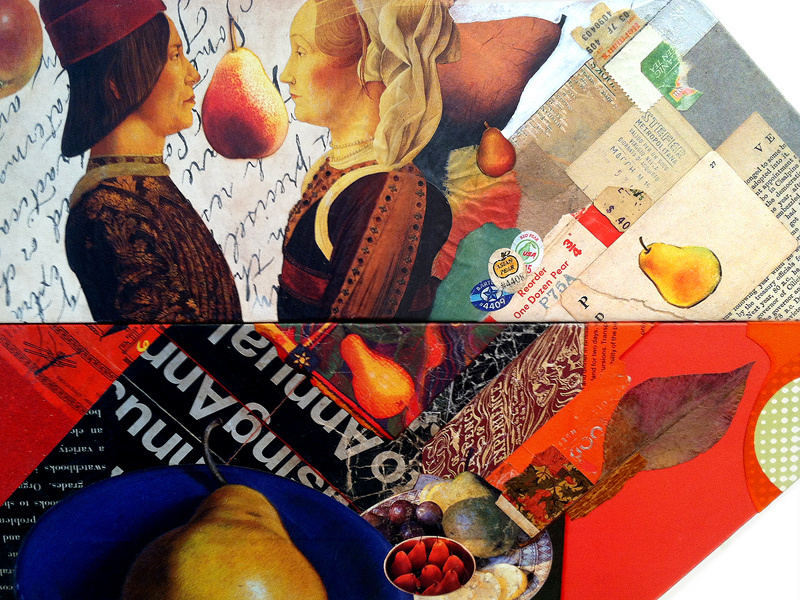 With the capacity to transcend the “scrapbook,” fine art collage is ideally suited for such an endeavor. 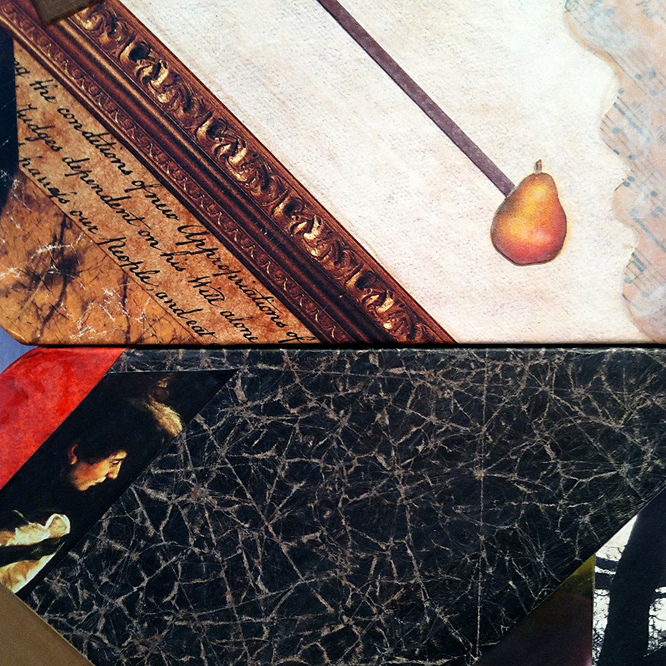 It was the client’s idea to approach the commission as a triptych, or three separate panels, that would convey the themes of body, mind, and spirit. I wanted the components to work as a total piece, but also for each to have a stand-alone quality. Whether they stay together or part company will be left to future circumstances and decisions. 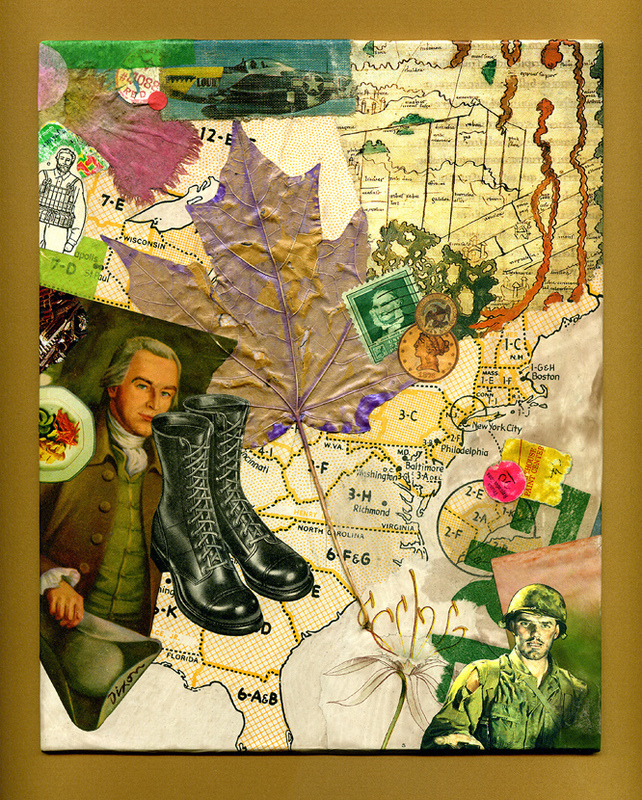 The resulting “legacy collage” is a distinctive creation that preserves images representing the life and guiding principles of a unique individual. It has been my honor to provide that creative service to her. 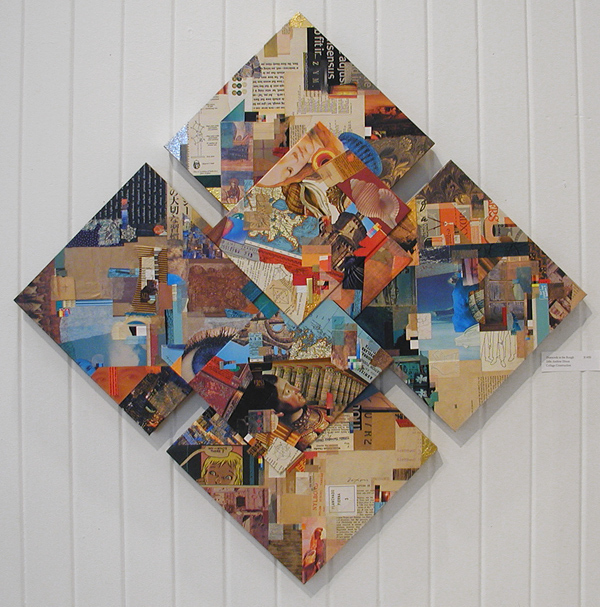 One of my first large-scale collage concepts was an artwork I called Pearallel Universe. 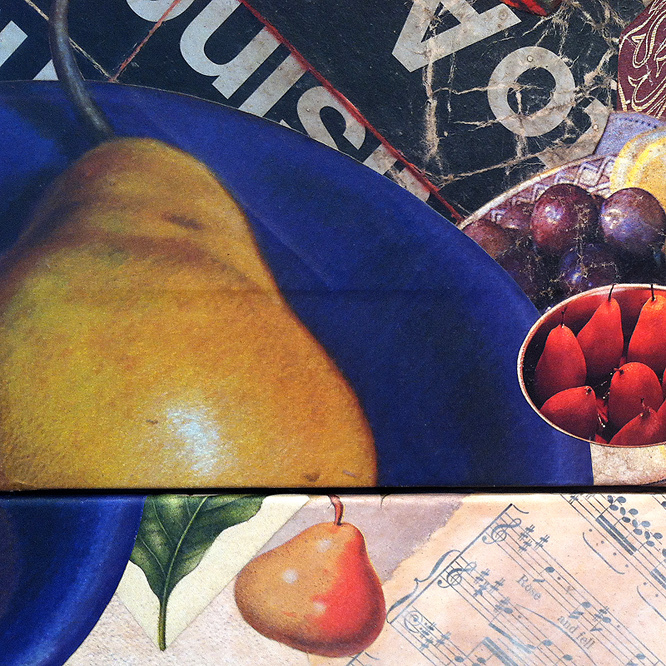 When it was purchased by a regional health care system to hang in a new patient facility, I temporarily set aside the “visual pun.” After creating Pearental Discretion last year, I continued to accumulate images in anticipation of another takeoff on the pear theme. I also had been looking to break out of the conventional rectilinear format by exploring thumbnail concepts with polygonal shapes. When the parallelogram repeatedly occurred in my tiny sketches, the two ideas merged, unsurprisingly, as Pearallelograms. This latest collage construction is another attempt to liberate collage from the typical “framed-behind-glass” approach, to recapture the medium’s painterly roots with an exposed surface that can stand on its own, and to introduce a more three-dimensional context that presents the end result as an “artifact.” I would hope that I had a bit of success at meeting these objectives. So far, the piece has been well received. 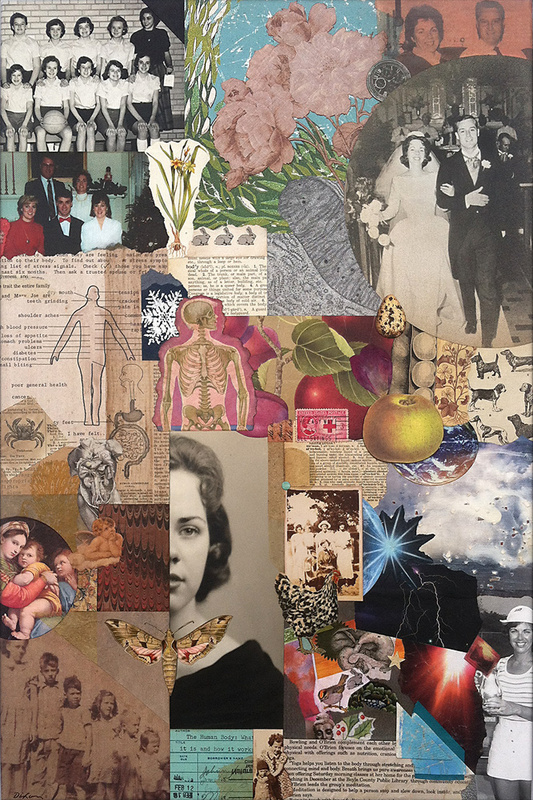 In what is becoming a ritual post-mortem for bigger collage artworks, I have repeatedly cropped the composition to explore and internalize aspects that may not have been apparent to me during creative formation. It is something I recommend to fortify intuition. To be honest, I would rather not be thinking consciously about the design dynamics in process, but I can only maintain that orientation by imposing a rational critique on my work after the fact. This sometimes leads to the closing refinement of an unfinished piece. More importantly, it also provides a stronger foundation for spontaneity in the future. for thematic rhythm, and as devices for a surreal touch. three negative areas that needed more spatial activation. resonates with a more literal treatment at the very top. 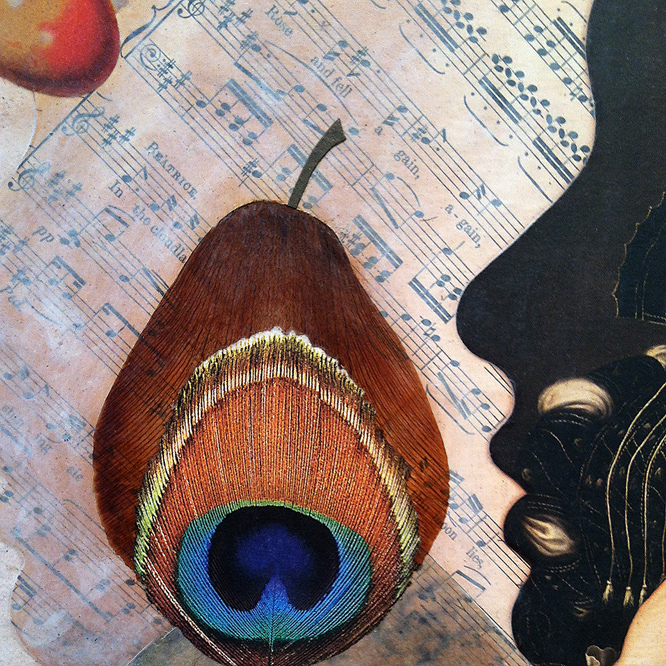 the torn image of a peacock feather, and a cut-paper stem. Thanks for visiting! Forgive me if today’s entry is too verbose, because I generally try to avoid that. If, however, you don’t mind if I wax wordy, please register and comment here to let me know. I promise to reply. 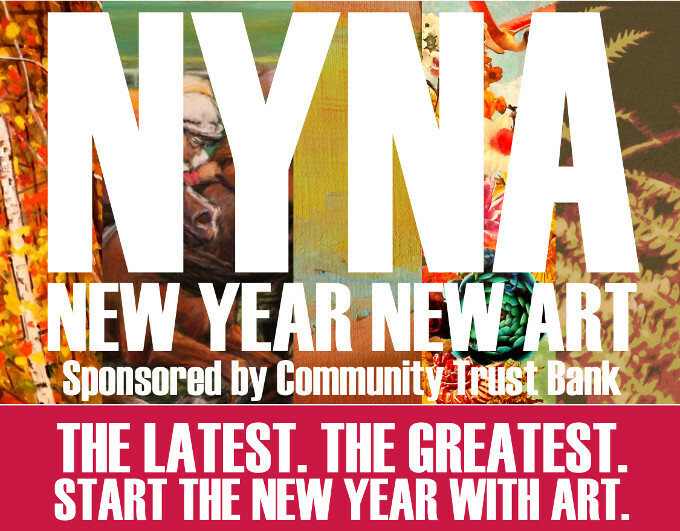 One of my most anticipated exhibitions of the year is the annual New Year New Art show at our local Community Arts Center. For the fourth year running, the invitational has been organized by Brandon Long. The current installment is the biggest ever. A versatile artist and designer in his own right, Long is a confidante, motivator, and energetic ambassador for the arts in Central Kentucky. He has both the artist’s and the institution’s best interests at heart, and that is not an easy balancing act to pull off. 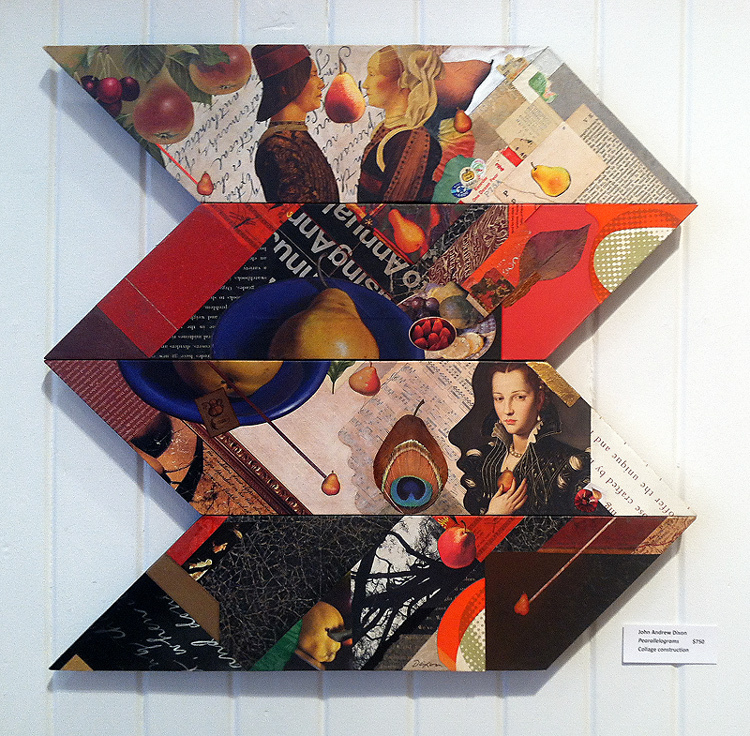 Whatever else may transpire in the year to follow, it is gratifying to display new work of my own choosing among friends and fellow collage artists such as Kathleen O’Brien and Connie Beale. If you are in the area and weather cooperates, be sure to check out this outstanding January show. 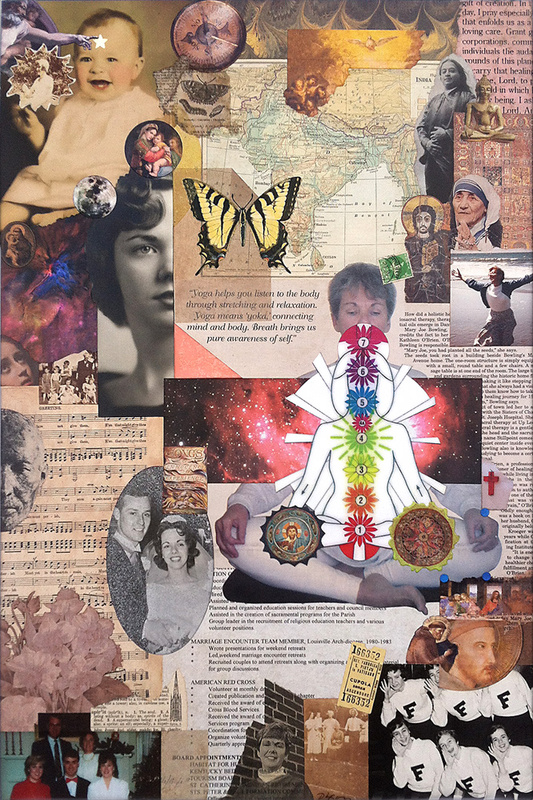 Knowing that whatever I create will have a public unveiling, surrounded by selections from some of the finest regional artists, has challenged me to transcend self-imposed perceptions about the medium of collage. It also has spurred me to lift my artisanship up another notch for the upcoming year. Two ideas converged to spark Pearallelograms — more details about the piece in my next entry. 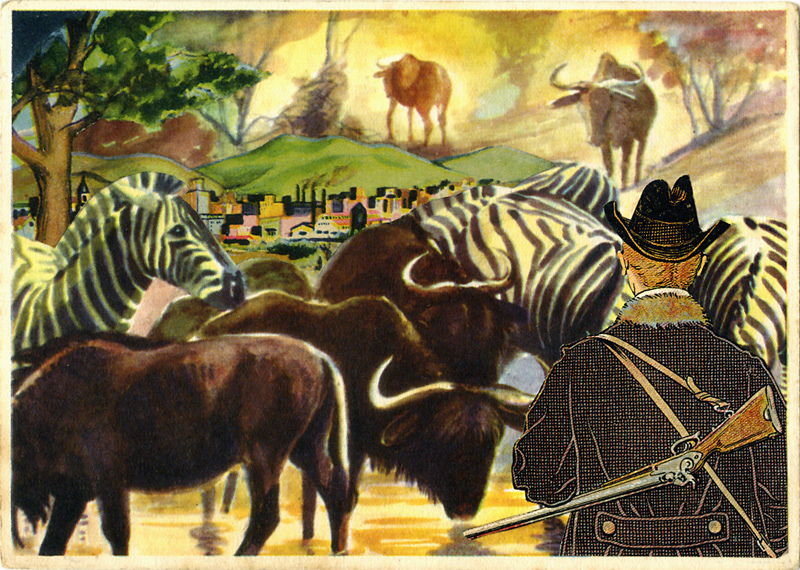 You are currently browsing the The Collage Miniaturist weblog archives for January, 2016.